Beyond the Rann: Exploring India’s Western Desert in Kutch, Gujarat. The Smallprint: Thank you to Kutch Adventures India for hosting my stay with them. As always, the stories, experiences and opinions expressed here are purely my own. This post may contain affiliate links. For more information on what type of organisations I collaborate with and on affiliates, please read my Editorial Policy. Kutch is famous for a few things: first and foremost it is known for its rich traditions in handicrafts and the craft market that takes place every winter. It’s also famous for the Great Rann of Kutch: a huge salt marsh located in the Thar desert – stretching from Kutch into the Sindh region of southern Pakistan. Many of those who come to visit Kutch, Gujarat, come to see the famous Great Rann, one of the largest salt marshes in the world. I’d come for a slightly different reason. I’d come to Bhuj, the capital of the Kutch region in Gujarat to visit the award-winning Kutch Adventures India, who’ve been recognised internationally for their efforts in responsible tourism, through promoting better engagement of people across cultures. Things to do in Kutch, Gujarat. Despite its relative fame, things to do in Kutch are far from restricted to visiting the rann. Arriving by train from Ahmedabad, Gujarat’s capital, Bhuj would be my base for exploring the region. Bhuj itself has its own less than happy claim to fame. In 2001 it was partly destroyed by a huge earthquake, measuring 7.7 on the Richter scale and killing up to 20,000 people. Nearly 400,000 homes were reduced to rubble, including that of founder of Kutch Adventures & my guide for the week, Kuldip’s. Despite the earthquake, some of historic Bhuj remains. You can spend a day or two happily exploring this town visiting temples, admiring its old walls, and the Pram Mahal, a gothic-like palace. Bhuj is a logical choice to base yourself during a trip to Bhuj – I stayed with Kuldip’s family in their homestay, on the edge of the new town which saw many houses built following 2001. For exploring Kutch itself, I spent most of my time outside of Bhuj, heading off into the Thar Desert. 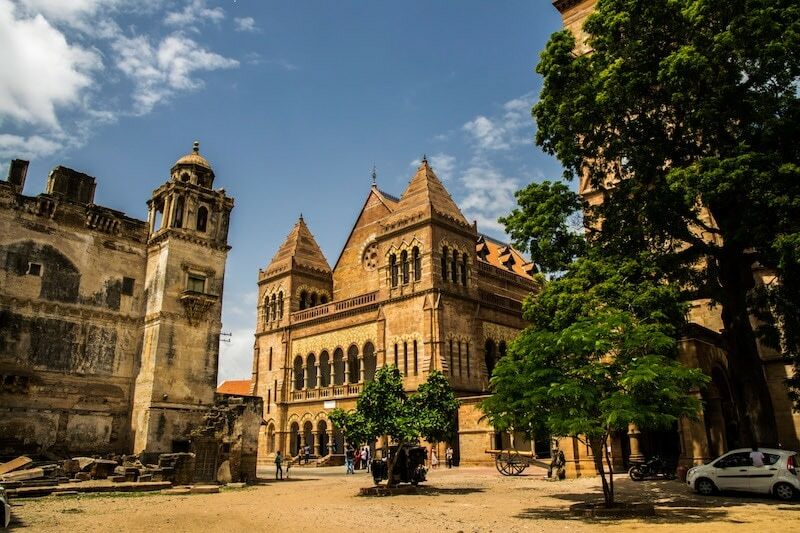 Exploring the older parts of Bhuj – the Pram Mahal. During my journey through India this August, I came close to India’s borders several times. In Ladakh, with China, at Amritsar – at the famous Wagah border with Pakistan – and again here in Kutch (with Pakistan). Exactly 70 years previously in the partition of India, the country was ripped into two parts to form Pakistan and the new India. Perhaps nowhere were the messy consequences of partition more obvious on my trip than here in the region of Kutch. Just over the Great Rann – and visible on a good day – lies the other half of the Thar Desert, and Sindh province in Pakistan. Overnight in 1947 communities became separated, and wider families, still, to this day, are not allowed to visit one another across the border. We drove through the well-known village of Khavda, one of the closest accessible villages to the Pakistan border and the unofficial “hub” for trading accross-the-border. Visiting families in the That Desert. Either side of the border, similar traditions and communities are present – both in Sindh and in Kutch, from the types of desert village, down to handcraft traditions and preferred styles of block-printed cloth. My days with Kutch Adventures were spent visiting villages within the Thar Desert, having many a cup of chai with them, and (with the help of translation) learning more about their traditions and community life. Kutch Adventures has won awards for the non-intrusive and authentic way that they have managed to share Kutch’s rural culture with guests without having a negative impact. What was immediately obvious was Kuldip’s good relationships that he has built up with communities over a long period of time, allowing him to bring outside visitors in from a position of trust and respect. These are sensitive communities. There are relatively few foreigners that make it to these parts, and those armed with a large camera are often viewed with suspicion, as we found out. Attempting to learn lacquering (with little success) at one of the villages we stopped at. Many of the women of the different tribal communities are beautifully dressed with ornate jewellery, large nose rings and beautiful golden earrings. Their costumes are a cultural photographers dream. Being a blogger myself (part of whose job it is to capture the experience), and travelling with a photographer in our small group, we wanted to see if we could get some photos. When we asked if it would be ok if we could take a photo, often, the answer was no (which we course of respected). Even driving past one richly dressed Rabari woman on the road, on seeing foreign faces in a car she immediately covered her face. Suffice to say that not all of travel’s beautiful moments can be caught on camera. Parts of Kutch that are nearer to Bhuj have seen an influx in visitors (both domestic and foreign) to handicraft villages, and as a result the villages have become over commercialised – children ask for money for photos, and it’s all about selling to tourists. The challenge is on to avoid this happening further afield in more remote villages that produce handicrafts. Lady in the village producing lacquerwork that we visited. On my third day in Kutch, we set out to explore the desert areas, following in the footsteps of a particular group of nomadic people: the Rabari herders. Rabari people can be found in the semi-desert region of Kutch, but also in Sindh province in Pakistan, the desert areas of Rajasthan and even Punjab. Historically, the Rabaris were camel herders, but they also herd sheep. The herders live an almost completely nomadic life – moving around from place to place in the desert with their herds, and sleeping under the stars or in tents. We caught up with some herders in the fields, and visited the families of others living in villages, while other members of their families continued the nomadic herding tradition. In Rabari communities education and literacy are not really considered priorities, many cannot read/write (especially women), and child marriages, as young as nine, have been a tradition. With new laws in place for the minimum age for marriage, today betrothals / engagements still take place at a (very) young age, but the marriages are deferred – or that’s what we were told at least. My turn to get dressed up in Rabari costume! Thanks to fellow traveller Amalchi for this photo – you can check out his Instagram for more Kutch pics here. Visting Rabari families, one thing stood out: the warm welcome. We were ushered in to numerous houses and huts, and handed endless cups (or I should say saucers!) of chai. In Kutch, it’s customary to drink tea from a saucer rather than a cup. It takes a bit of getting used to! At one family’s house, they rightly decided that we should be their entertainment for the afternoon, and decided to dress me up in traditional Rabari costume. Rabari people are famous for their elaborate jewellery – some ladies wear incredibly large and heavy nose rings which need to be supported by a chain that goes back to their head. Their embroidery is also intricate and beautiful, and many people come to Kutch to buy Rabari needlework. Weaving on a (huge) loom is also a way that many families make a living in this part of the world. Kutch is famous for its handicrafts. Some of the traditions of the communities in this part of India are block-printing (fabric), beading, weaving and lacquerwork. It’s possible to buy authentic handicrafts from large galleries and shops in Bhuj, but seeing the small villages where they were directly made – in a non commercial setting – was a very special experience. And this is where Kutch Adventures’ connections come in. Kuldip knows exactly where to take his visitors so that they can see the process of making handicrafts locally, in a non-commercialised way. They also refuse to participate in the standard commission-driven setup, which determines where many guides take their visitors. One of my favourite visits was to a family of block-printers, who had been printing fabrics in traditional Kutchi patterns for generations. I not only got to see them at work, but to have lunch with them. Fabric being dyed yellow is the first step prior to it being block-printed with other colours. My guide Kuldip (right) chatting with family members at the block printers who we had lunch with. After all – it would be a shame to give Kutch’s best known tourist attraction a miss! I visited during monsoon season, in summer, where instead of being a salt desert, the rain is actually an inland sea – referred to sometimes as the “Great Sea of Kutch”. Traces of salt were visible on the edges of the “sea” and in the shallow water, but the Rann looked very different to how it does in winter. As opposed to dazzling white, the Rann was a dull grey. It is still a beautiful spot at any time of year though to experience this vast expanse of space, and in monsoon season, you’ll practically have the space to yourself. My tip would be to avoid driving as far as you can go, down the viewing point at the end, and instead go for a short walk along the edge of the salt marsh for a view to yourself. There is a resort nearby called the “White Rann Resort” which we walked past (but did not stay at). Considering this backs on to an Indian army base, is in the middle of nowhere and was completely deserted, I would not recommend this as a place to stay. There are plenty of alternative options, which Kutch Adventures can suggest to you if you want to stay near the Rann. Where have you come across the most unique and interesting culture on your travels? Let me know in the comments below! Finally I had time to read it properly 😉 Thank you so much Ellie, Looking forward to host and tour you around Kutch once again in future. Hope you’re doing well and life is good.